We saw a lot of different Humpbacks during Monday’s Wake up with the Whales Cruise (maybe as many as 18) including a couple of breachers in the distance. We spent most of our time with a couple of different competitive pods who, as usual for competitive pods, were busily chasing and shoving each other around. A couple of times we were surprised when whales surfaced just inside that 100 yard limit — but we knew by their behaviors that they were much more interested in each other than they were in us. We also saw quite a few different whales during our Mid-Morning Whale Watch Cruise. We spent most of the cruise watching a Mom and calf. Baby was busily burning off some energy, and we saw quite a few baby-breaches from him. Towards the end of the cruise, Mom must have decided that Alala, and all of us aboard, were an ok thing, as she let her baby come very close to investigate. Of course, being the protective Mom that she was, she wouldn’t let him stray on his own, so we got a close-up view of her too. 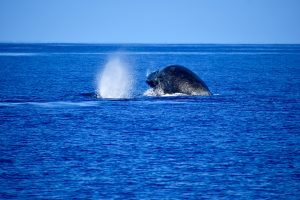 Ocean Sports Whale Fact of the Day: File this one under facts you’ll probably never have a reason to share…researchers off the coast of Brazil have discovered that some marine mammals including Humpbacks may have up to 14 spleens. Among other functions, the spleen stores red blood cells (which store oxygen)…so an extra spleen may help a deep diving animal stay underwater longer. These spleens can contract during a dive releasing fresh blood with oxygenated red blood cells to keep the whale’s important organs alive and functioning.